As in many things in life, when it comes to the success rate of your email blasts, timing is everything. If you’re looking for more email opens and click-throughs to increase traffic, it matters plenty what time and day you send out emails to your subscribers. This is because your loyal audience (provided it finds content useful or interesting) will share it after reading, leading to increased website traffic, new subscribers and customer conversions. Most studies show that working days have a significantly higher open rate than the weekend. Engagement metrics show that subscribers are mainly active from Monday to Friday. Weekends are considered leisure and family time, resulting in lower traffic. According to GetResponse, the best day to send emails is Tuesday, with the highest open rate. A study conducted by Experian found that Tuesday’s emails have an open rate of about 18%. Thursday has a slightly lower rate making it the second best choice. On the Harland Clarke Digital’s analysis, Wednesday made it to the top with Tuesday right behind it. Customer.io and MailChimp agree that the middle of the working week (Tuesday, Wednesday, Thursday) gets you the highest open rates, especially for informative emails that don’t require any action. However, the best day to send sales or promotional email is Friday. GetResponse found that Friday has the highest click-through rate, making the end of the week best for actionable email blasts. So when is the best day to send an email? If you’re looking for a single day that will get your email opened and get that link clicked, then Thursday is your best bet. Based on the overall inbox and traffic activity, the GetResponse research also points to Thursday, peaking in all the metrics: sent email, open rates, and click-through rate. Studies vary significantly when it comes to the best time to send an email. The tried-and-true strategy is to send out email blasts in the middle of the week and in the middle of the day. 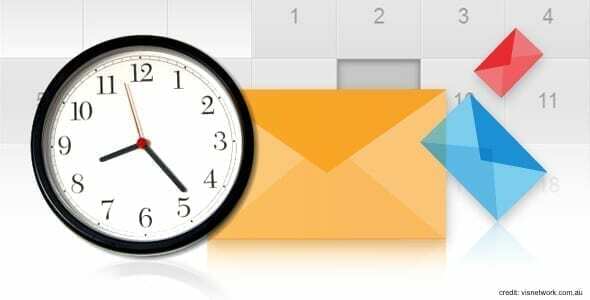 Generally, somewhere between 1pm – 3pm is what works best for email marketing, although some also suggest mornings between 9am-11am. 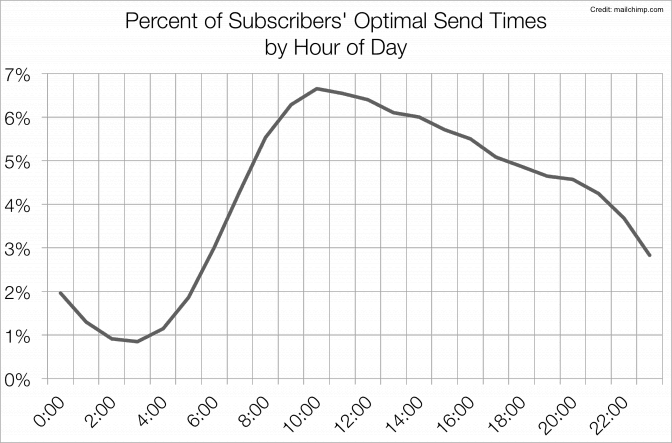 MailChimp noted a peak at 10am, quoting it as the optimal send time across their system. HubSpot gets the most email opens at 11am and WordStream’s data shows Thursday between 8am-9am as the best time to send email blasts. When MailerMailer ran the numbers they found that early mornings and early evenings have the highest open and click rates (their study draws similarities with that of Experian). However, Campaign Monitor‘s research shows that email opens correspond with an average person’s working hours. 53% of mails are opened between 9am – 5pm, with a slight drop at lunchtime. 47% of emails are opened outside of work and most of the opens occur on mobile devices. 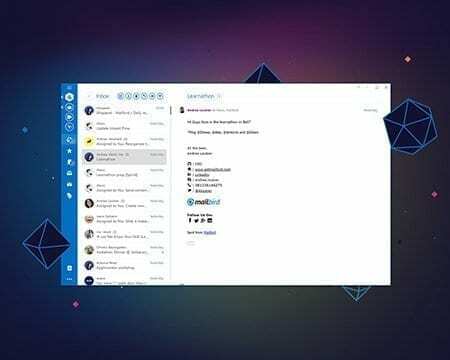 So when is the best time to send an email? For most opens or reads, send your email blasts between 12pm – 4pm. If you’re looking to engage your audience, send your emails early in the morning between 6 am – 8 am, or in the evening between 8pm – 12am. Metrics vary for different industries and according to the nature of your email. To determine when is the best time to send an email blast, first consider the type of email you’re sending. Knowing your demographics is a deal-breaker in your email marketing efforts. Understanding the needs and habits of your audience can determine your email open and click-through rate. Demographics trump any safe “best time to send email” bet. For example, most studies advise against sending emails at night, but if your audience consists of a large number of nurses or bartenders (as suggested in Mail Chimp’s post) with atypical working hours, then you’ll notice an increase in your open rate even at night. Your niche determines most of your audience, so if you’re in the retail or entertainment industry then Friday’s the best time to send email blasts and reach out to people just as the weekend’s approaching. Seasons and location play an equally important role. You can easily reach audiences in the dead of winter in the northern hemisphere even on Saturday and Sunday. To reach your audiences who live in different time zones at the right time, customize your email send times. There’s no one-size-fits-all kind of solution to the question “When is the best time to send an email?” To find out what works best for you, A/B test your send times as often as you can. As your audience increases so will the variety of habits you’ll need to cater to. Most marketers send email blasts 2-3 times a month and Marketing Sherpa conducted a survey about the frequency of promotional emails, which should give you an idea to start with. However, their findings are based on their audience. Schedule out the frequency of your emails based on your list. Subject lines are crucial in email marketing. It’s what gets your email opened and it’s probably just as important as the message itself. Give your email blasts an intriguing title, enough to tickle the curiosity of your audience. Pair it with a quality message and you’ve got a winning combination. The appearance of your email on the screen, the paragraph organization and overall esthetics, plays a huge role in getting your message across. With over 42% mobile open rates, it goes without saying that your emails should be mobile-friendly. People want something they can skim read, write short paragraphs and include bulletin points. And yes, replace those 1000 words with an image. 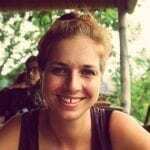 4 thoughts on "Best Day And Time To Send Out Emails 2018"
Useful information to know. Thanks. Great article , for me midweek newsletter yield the best results however I usually send it in the evenings so I cant recommend times.